Please see below further information about our industrial and commercial sectional overhead doors in London and Essex. Sectional overhead doors open vertically upwards, thereby creating space in front of and behind the opening. The door sections are parked directly underneath the ceiling, vertically above the structural opening, vertically up-and over or following the pitch of the roof. The exceptional breadth and depth of the range, thermal performance and certified safety make a sectional overhead doors convincing in every respect. Take advantage of well insulated sectional overhead doors in London and Essex from Abacus Shutters. 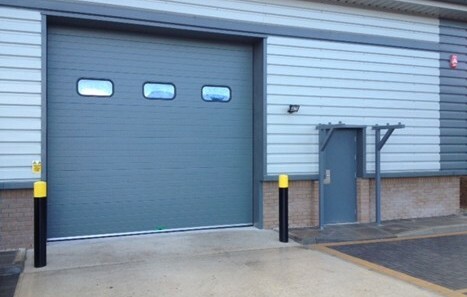 Thanks to our specialised building process, our sectional overhead doors are capable of withstanding even the harshest of weather conditions, ensuring you’ll have full cover and protection from the outside elements. As well as this, you can take advantage of window installation within your sectional overhead doors for clear visibility. Specially designed insulated panels incorporating a capillary break to eliminate water ingress. Exterior: 0.5mm British Steel – HP200, Standard Colour, Galvanised or Powder Coated. Interior: 0.4mm British Steel – Stucco Embossed, Polyester Coated or Galvanised. Normal Panel Width: 530mm – 610mm. Normal Panel Thickness: 40mm – 50 mm. 50mm thick rigid polyurethane foam. A density of 45kg/m³ and a U-Value of 0.44w/m³K. Cold rolled guide and angles made from heavy gauge pre-galvanised steel. Manufactured from ball races on plated bright mild steel. Tempered helical torsion springs on bright steel shaft, mounted by self-aligning sealed ball bearings. Carriers, hinges and reinforcing channel made from heavy gauge pre-galvanised steel. Rubber weather seals to top and bottom sections. PVC seals to guides. 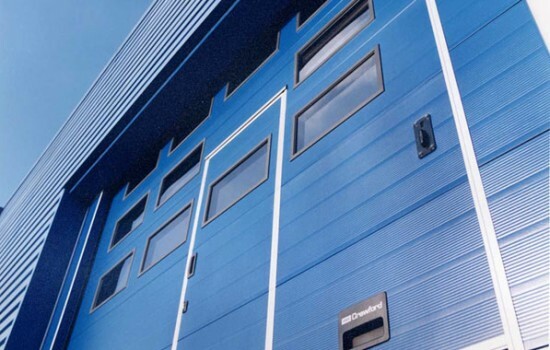 Please contact us directly by calling 0845 644 1225 for further information about our industrial and commercial sectional overhead doors in Essex, London and throughout the surrounding areas.